In Live Writer 4, all options to format a picture are moved to Picture Tool. When you select a picture, format tab of Picture Tool will show up in ribbon menu. You don’t need to switch between different tabs when you add watermark or change picture style. Photo Album Tools and Video Tools are also really straight forward. A new album style called Squares is added and is the default album template. A view all link is added to top right next to date option. If you click View all, Live Writer 4 will bring up a floating Post Properties dialog in which you can update all post options supported by your blog app. If you have a link URL on the clipboard, Live Writer 4 will paste it to to web address textbox when you bring up the insert hyperlink dialog. This is the greatest feature I like in Live Write 4. In Live Writer 3, thanks to Spell Checker, all misspelled words will be underlined with red line. This is enhanced in Live Writer 4, if you have a obvious typo for example, teh, live writer will automatically correct it to the, this is very similar to Outlook 2010. If Live Writer exits unexpected or crashed, next time it’s launched, you will have the option to recover the last post. Find Live Write log is pretty easy in wave 4. 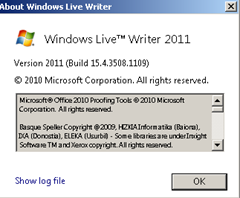 Just go to About Windows Live Writer dialog and simple click the “show log file” link.